The following is an in-depth demonstration with video and images, designed to help you learn the traditional method of painting faux oak, generally considered the most difficult wood-grain to simulate in paint. I made about an hour of footage following along as I explained on-the-job faux cerused (or limed) oak. There are some things that I glanced over or skipped entirely, but hey; it's free. So no complaints. I tend towards more subtle effects personally, as far as wood-graining. If you scroll way down to the bottom for a finished shot, you'll see what I mean. Your owns style will develop naturally, and with practice. 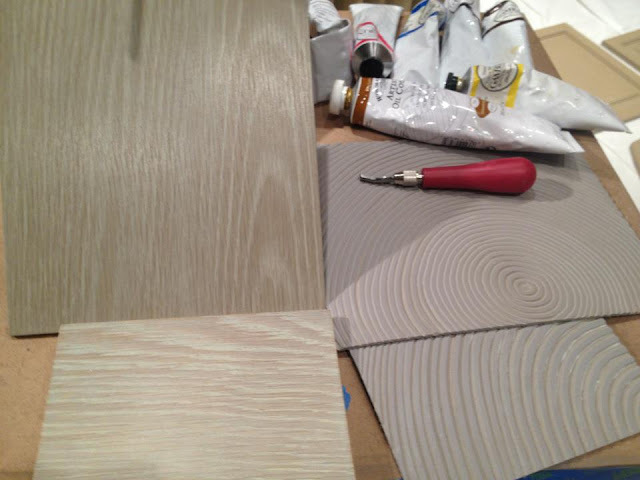 The introductory photo above shows my painted faux cerused oak (top left), the real sample (bottom left) that I was asked to match, and some custom tools I cut from linoleum to assist me in the graining. The first video is a quick rundown of my recipe for this faux finish. I don't go in to detail about color mixing here, as I'm assuming some knowledge on your part, but you get the basic setup. Mixing colors is an art that takes a long time to learn. There is plenty of info on palette choices by artists for different techniques in the literature and online. As a great starting point, I recommend Parry's "Graining and Marbling" (1949), and Finkelstein's "The Art of Faux" (1997). As you can see in the above photo, I keep sample cards for each job. This is very important. The card on the left shows each step, staggered down the page in taped-off strips, right up to the finished spattering step. The card on the right has notes and separated color swatches of my colors. These are not the colors from the cerused oak job, by the way. "Lime, whether applied accidentally or deliberately, remains in the pores of the timber, and also influences the general colouring according to the extent or period of saturation, the state of the time, and the age of the oak. the result being a universal darkening of the figuring and lightening of open pores. We must draw a sharp line between the genuine limed oak and limed oak effects obtained by the use of oil-bound distemper. 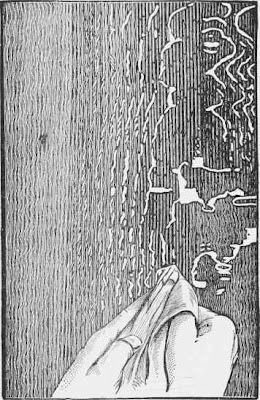 The latter has no darkening effect on the figure, but rather the reverse. It imparts, particularly in the case of new oak, a soft bleached appearance." Flogging with the horse-hair brush is the proper method for laying in a ground layer of pores, simulating the open cells of sawn hardwood. 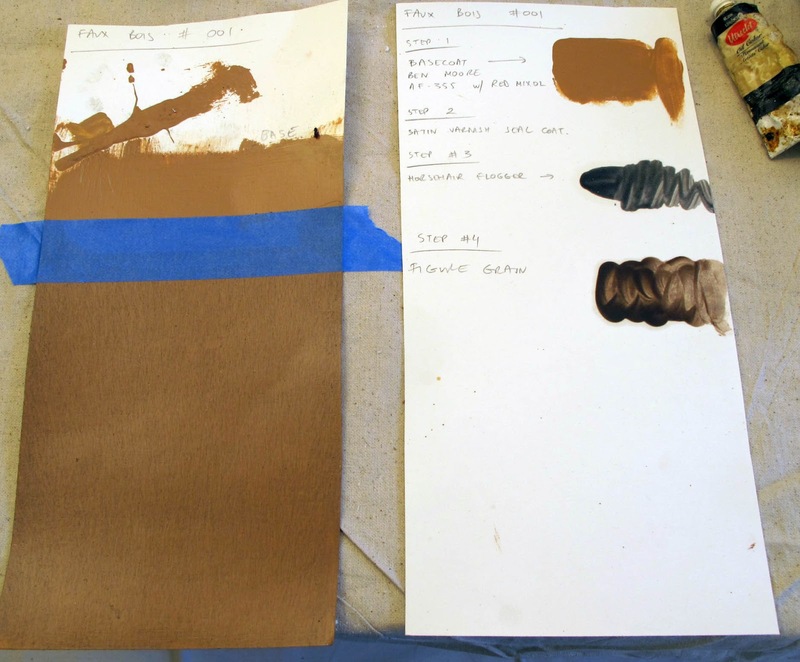 The traditional setup would be to use a reversible medium such as gouache or beer glaze, but I went straight for oil. Of course with oil, and in the event of failure, the whole thing can be easily washed off with a clean rag and white spirit, and the work recommenced. A job not possible in acrylic, and difficult in gouache unless you first seal each layer with shellac. 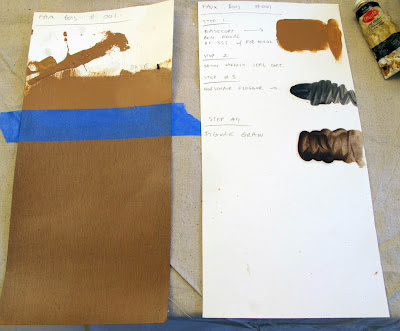 You do have to be careful to always adhere to the "fat over lean" rule regarding layers of oil paint. In other words; your base layer should always have less linseed oil than the layer above. In the case of multiple layers, increase the amount of oil as you move up. In the video, I stretch the glaze with a spalter, then flog my glaze from the bottom to the top, and left to right (on open panels), paying attention to the direction of the wood. Keep your brush clean, and wipe it often on a rag. You can re-flog the wet glaze layer as many times as you like, but each time you go back over it with the flogger it will reduce the size of your pores. In the case of oak, the pores are very open so I only flogged once. A quick word at the start regarding all those dirty rags: Dispose of them carefully! With all the linseed oil floating around, you can easily start a fire. Once the pore layer has dried, we are ready for the figure graining. In the video above, you can see the heart- and straight-grain being laid in, and my method for doing it. I go over it in the video, so I won't repeat myself here. Instead, I'll quote heavily from Parry's text, which you should definitely read because he has some added points that I don't cover. Don't make this stuff up. Graining as a craft has a long history, and there is a very distinct look to natural grain. There's nothing worse than "wood-grainy effect". Do a Google search on oak grain, or better yet; visit your local museum and photograph old English furniture. 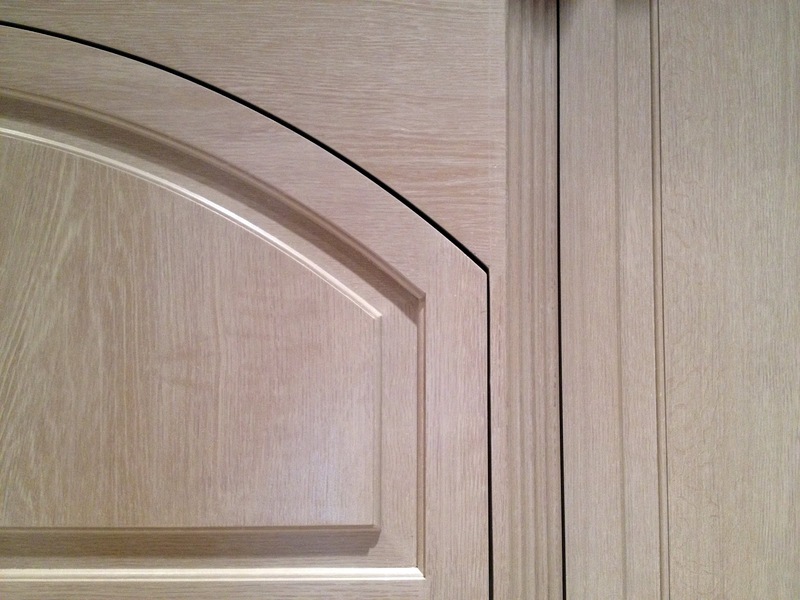 It's guaranteed to have the best natural examples of oak grain. Buy old books, and practice. "Although many examples are similar to ash, there are certain characteristics which are only to be found in heart of oak. These differences must be grasped before they can be freely exploited by the grainer. The 'oak sap' - as it is frequently, and erroneously, called shows considerably more ruggedness and variety of shape. The ends or outer edges of the concentric elliptical curves are sharply spiked, widely varied in thickness, and, as if in a final effort to break loose, the ends assume the most fantastic twists and turns, no two being exactly alike." 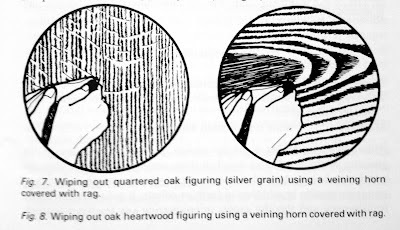 "The heartwood is mainly employed in situations where it would normally be used by the wood-worker, i.e., for cross rails of doors or other work secondary in importance to the choicer quartered oak paneling. If the grained work is to appear natural, it should never give the impression of being 'centered'. This can so easily be avoided; indeed, where short lengths of timber are concerned it is better to omit the central curve and display the more interesting features of the wood. A word of caution becomes necessary at this stage: be careful when graining the more intricate end shapes, as these, if overdeveloped. will upset the balance of the whole composition. It is not easy to lay down any hard-and-fast rule, but we would strongly urge all beginners to keep the extreme widths of such parts noticeably narrower than the points from which they are developed. By this means we are able to maintain the characteristic tapering formation which is common to most woods." "For the wiping out of heart grain we fold a double thickness of clean rag over the veining horn. gather the loose ends, and hold firmly together with the other hand. This is a two-handed job and although one may at first feel extremely awkward when sketching the pattern with these unfamiliar implements, it will not be long before some measure of control is acquired. An expert grainer continues to wipe out with the right hand. white frequently giving a sharp putt with the left in order to maintain a clean working edge, all without cessation of work. Cleanliness and sharpness of definition are important factors which cannot be obtained except by the constant changing and tautness of the rag which covers the veining tool." "Many grainers use the thumb-nail and are quite convinced as to its superiority in all types of wiped-out figuring. It can, however, become a painful operation after several days of continuous work, and in any case it less hygienic than the method recommended above. The handiest veining horns are those about 100 mm in length. These are already shaped; round at one end, fairly square at the other; and it is the square edge which gives the greater variety of shapes." 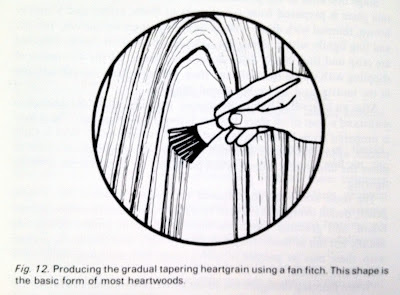 "In wiping out the hearts it is advisable to use the tool at the same angle as one would use a flat fitch, i.e., with the square end parallel to the direction of the grain. 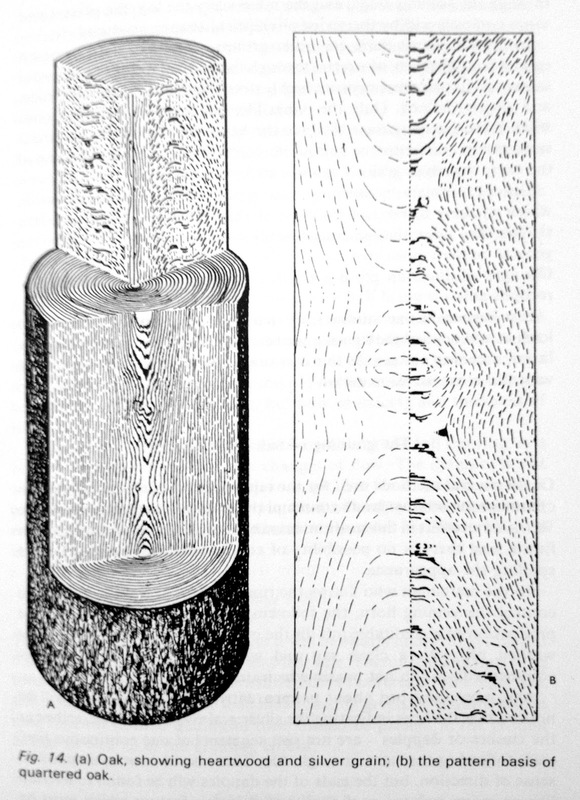 The long straight lines are wiped out with the angle nearest the direction followed, and by maintaining the firmest pressure at this point, we can, when forming the elliptical ends of curves, produce the required thickness of line and at the same time leave the outer edge sharp and the inner edge fairly soft." This video has annotations and music, which might be annoying, but whatever. 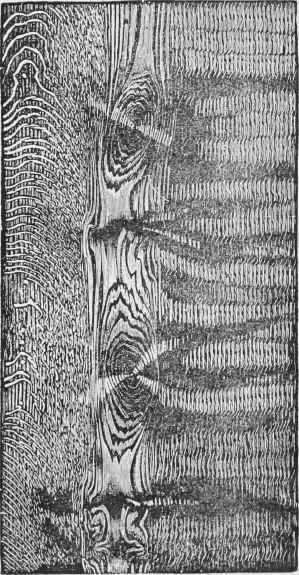 "Combing provides a simple method for the portrayal of coarse grain, particularly for oak and pitch pine. An examination of the plainer parts of these woods will reveal some interesting differences; pitch pine exhibits a certain boldness and continuity of line with fairly even balance between light and dark areas; oak is characterised by its vastly different ratio of lights and darks, the latter - which are actually broken line effects produced by the pores - occupy something like one-fifth to one-tenth of the width of the lighter parts. It will therefore be evident that each requires its own particular combs and technique. Rubber combs may be cut from waste pieces of linoleum, rubber or leather or other material of stout quality. These can be rectangular in form and of sizes varying from 50 mm by 75 mm upwards. Teeth are formed by cutting deep grooves of the required width on all four edges, but this must not be attempted until each edge has been accurately squared and straightened up: this latter point is important, as the comb will not wipe out cleanly unless the edge is maintained in a sharp and square condition. When forming the teeth, due regard must be paid to the effect desired. 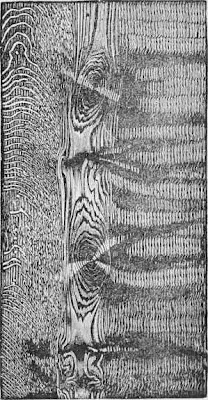 In pine, for example, the notches and teeth are of equal width; in oak, the grooves are extremely narrow and the teeth are comparatively wide. In both cases it is desirable to make at least one comb with teeth on the several edges so graduated in width as to reproduce that natural coarse to fine variation in the graining." "Apply the glaze colors with a clean "rubbing-in" brush and reserve the mottler or cutter for its own special job of removing ribbon-like highlights or large areas interspersed with darker shades. If stronger tones are required, these can be applied with the fitch, but the whole work must be done expeditiously, to allow time for softening. Do not overdo the mottling, but seek inspiration from the natural wood, and it will soon be evident that light and shade are most pronounced in those parts of the grain which twist and curl away from the main direction." 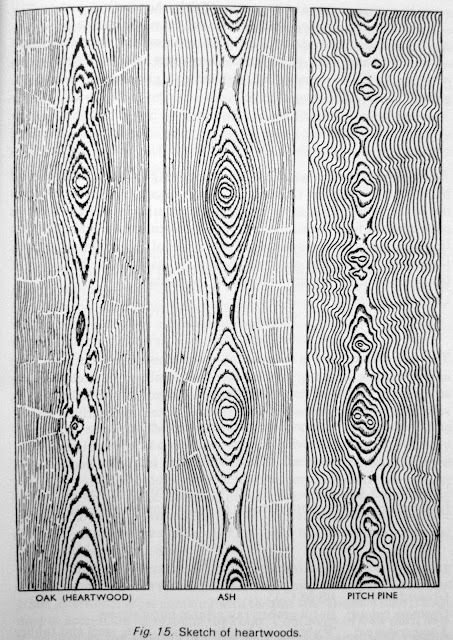 "The lines indicating the silver grain - popularly described as the clashes or dapples - are not just segments of one continuous line, each following the next in single file. There is, of course, a common sense of direction, but the ends of the dapples will be found to overlap like so many isolated roof tiles, and it is this feature which must be continually observed even though the lines curve and change direction. Notice also the steep pitch of the slope, a positive advantage when twisting and curling the run or flow of the grain." 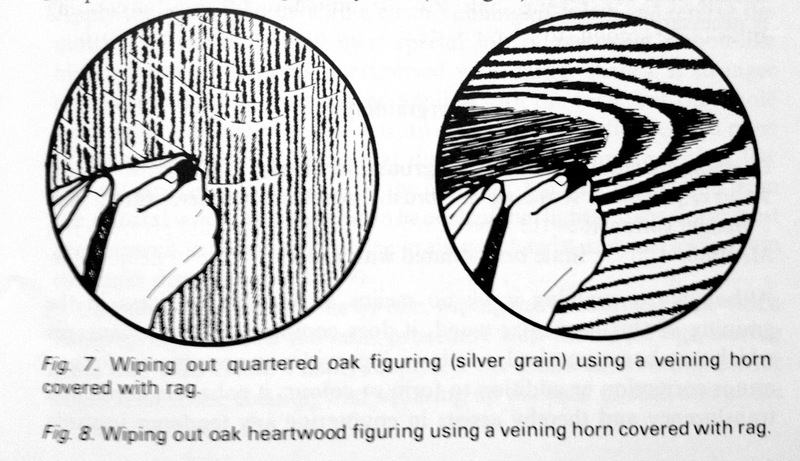 Armstrong's Cyclopedia of Painting has a great article (free online) on faux oak, with the illustration above demonstrating the method for wiping out the silver-grain. You can clearly see where a narrow steel comb is first dragged though the glaze (on the left side), and a wider comb is then struck vertically through the waves. This simulates the smallest silver-grain. 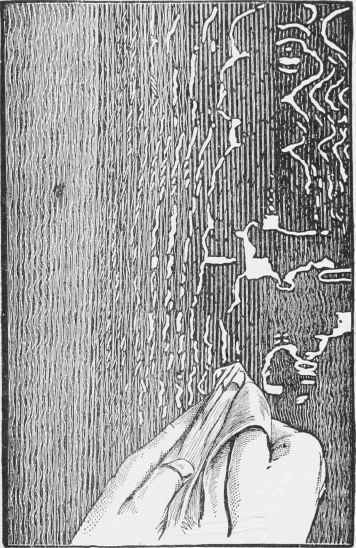 As the silver-grain gets larger, moving to the right, the background combing becomes vertical, and a rag is used to wipe out the silver-grain. "(An) impression may be obtained by 'spattering' the work with colour which is brushed against and through the teeth of an ordinary comb. The effect will be more or less pronounced according to the consistency of the colour and the distance between the comb and the surface treated. It is usual to supplement this method by an immediate light dragging action with the badger softener in one direction to pull the specks of color into elongated pore marks." "May be employed at the grainer's discretion when it is desired to accentuate the pores; otherwise it is unnecessary. The roller will behave equally well with an oil or a water medium. The roller is fed with color from a wide mottler or brush which must rest lightly upon the upper edges of the serrated discs. 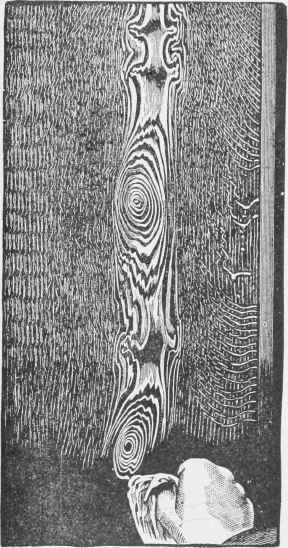 The roller is moved forwards in the direction of the grain, leaving the pore-marks clearly defined. Too much pressure with the brush has the effect of removing color and leaving the discs clean. If color is too thin, the result will show an ugly series of blobs. Yet another case where success depends entirely upon practice."